My Afternoon with Jack Johnson. The recent articles on former heavyweight champion Jack Johnson, a native son of Galveston, prompted me to relate my experience with the great one. The time was 1935 or 1936, I was a young high school student in Denver, Colorado interested in girls, football and boxing, in whatever order that they were presented to me. In those days my father used to give me a quarter to spend for lunch. This was adequate then, in fact we used to get by for a dime (a bowl of chili and all the crackers that we could eat). We would sometimes ditch school and go down on Curtis Street, and for another dime attend one of the many movie houses that lined the street. It was on one of these excursions that I spotted a side show. These shows were remnants of Carnivals and circuses that were closed for the winter. There were posters outside showing a very fat lady, Eiko and Leco, the sheep headed men and Jack Johnson, ex Heavyweight Champion of the world. After the pitch man outside convinced about twenty people to come up with a dime we went inside. On a platform about ten feet square and eighteen inches high stood Jack Johnson in the classic boxing pose, left arm extended, bent at the elbow, fist closed with the palm up, right hand cocked, ready for action. He answered questions from the small crowd. During this time he noticed me, and asked if I was interested in boxing. I assured him that I was. When the group dispersed, he told me that I did not have to leave, so I spent the remainder of the afternoon just talking and getting boxing tips from the ex champ. This was in between shows (about twenty minutes at a time). Later on, I did have one bout refereed by Jess Willard, and another by Mickey Walker. But wasn't good at it so I quit. 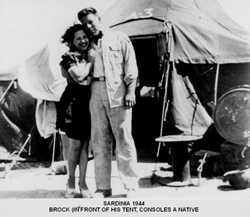 Brock, in front of his tent, consoles a native." I think that Galveston is overdue in honoring this man, and that they should do so. Not to exploit Galveston, but to honor him for what he was, a great and courageous human. His biography may never mention that at one time he had to appear in a sideshow to make a buck, but I will always cherish the time he spent to encourage a young, aspiring boxer. Do you know? Not even once did he ever ask "Why in the hell aren't you in school"? That folks, is a GREAT MAN.